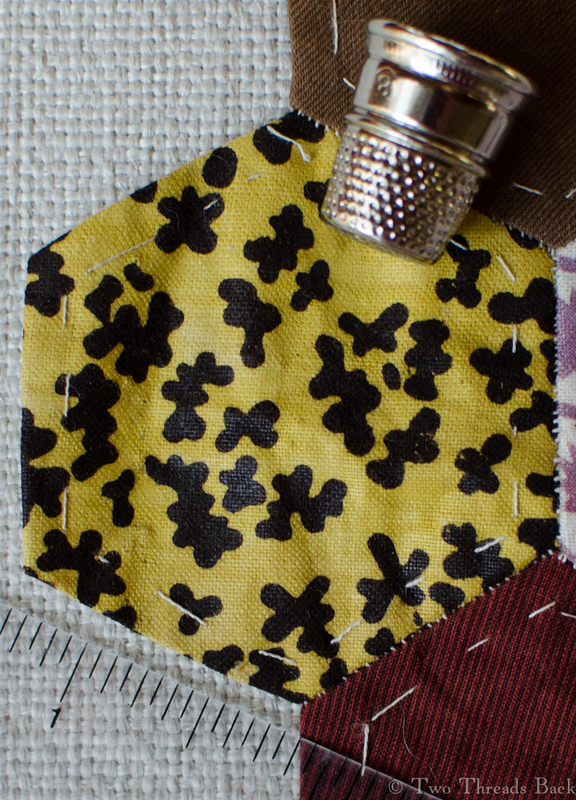 This flower patch is all dressed up as a leopard for Halloween, shown with a thimble and a ruler (inches) for scale. The edge by the ruler is about 1.25″ long. 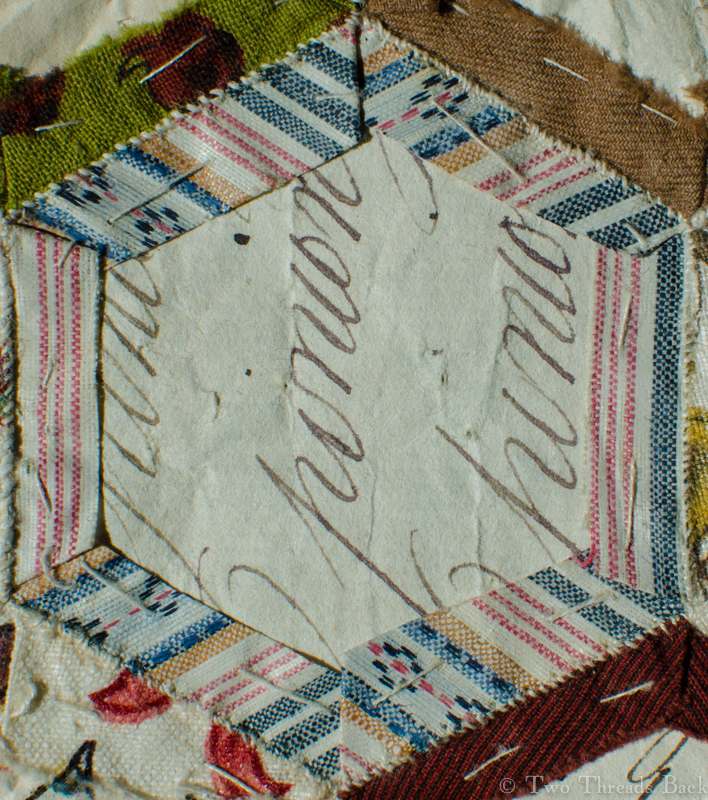 Like the others in the quilt, it dates to the early 19th century. I haven’t forgotten the plan to keep adding early prints to the Flower Patch collection here at Two Threads Back. I just lost sight of it for a little while. Literally. Occasionally I get hit by a frantic cleaning frenzy and start to clear out and organize everything, almost compulsively. Yet every time I do, I forget where I’ve moved stuff. Out of sight, out of mind. The “out of mind” part is especially fitting. 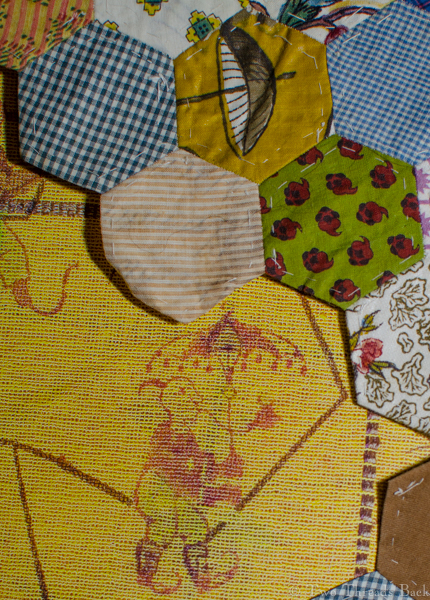 Anyway, I opened a box today and there they were, the quilt pieces, waiting reproachfully for some attention. 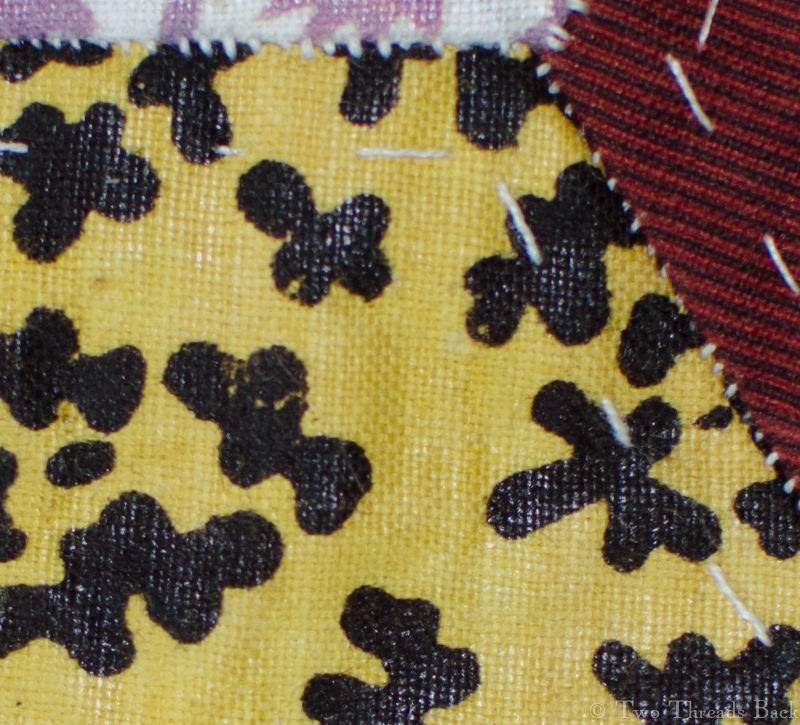 So I selected a wild little print, an early calico reminiscent of an animal pattern: leopard, amoeba, tortoiseshell? Hmm. I prefer the feline. Like the others, it dates to the first quarter of the 19th century, probably c.1810. But really, what Regency lady would dare to wear it? It’s certainly not for the fainthearted, a milk-and-water miss. Or am I being too…catty? 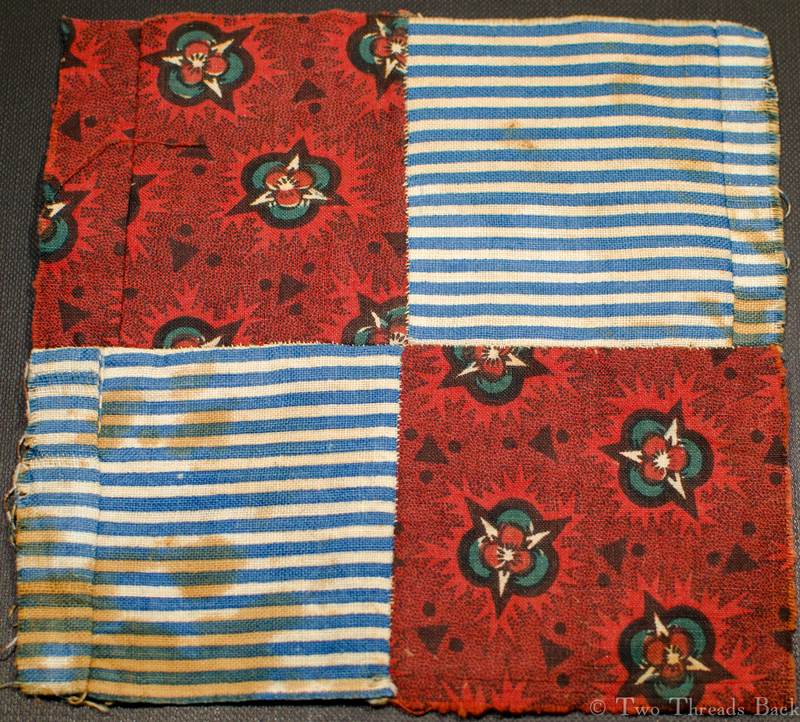 Front view – very vivid colors! And a close up with flash to show the heavy glaze. Maybe with a button-down and sport coat? I could easily see this pattern on a man’s shirt today. But what would it have been used for then – gowns, aprons, children’s clothes? These have the same glazed finish that many of the others do, and I’ve added the very last picture to try to show that. The same piece from the back. Another very contemporary looking pattern. I’ve tried to show how shiny the sizing is, but you may only see a really bad photo. 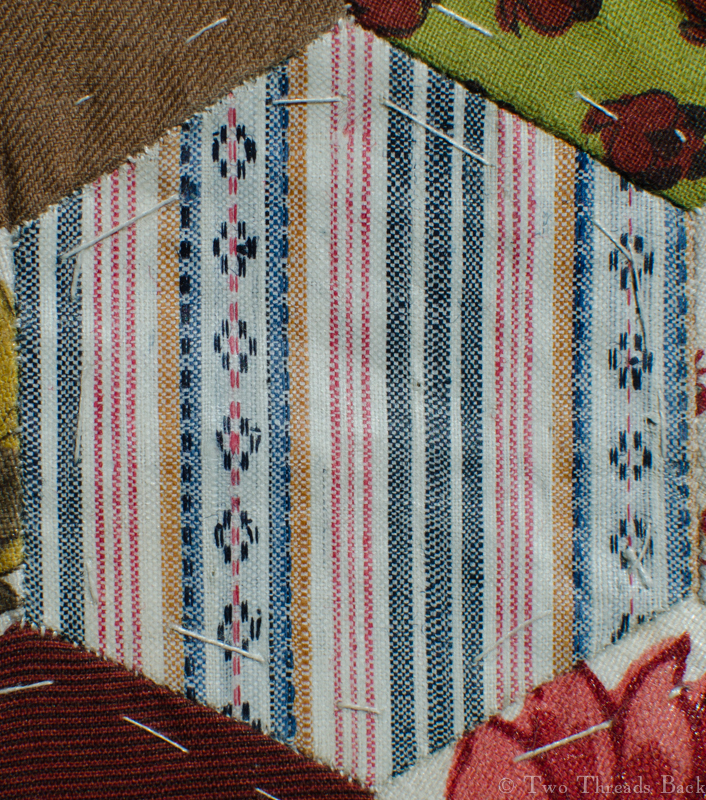 That “aha” moment, when a photo in a book bears a resemblance to a quilt patch. Finally, I found this illustration from Fashioning Fashion: European Dress in Detail, 1700-1915, by Sharon Sadako Takeda. (Fabulous book!) It’s definitely yellow. And the pattern is certainly exotic. 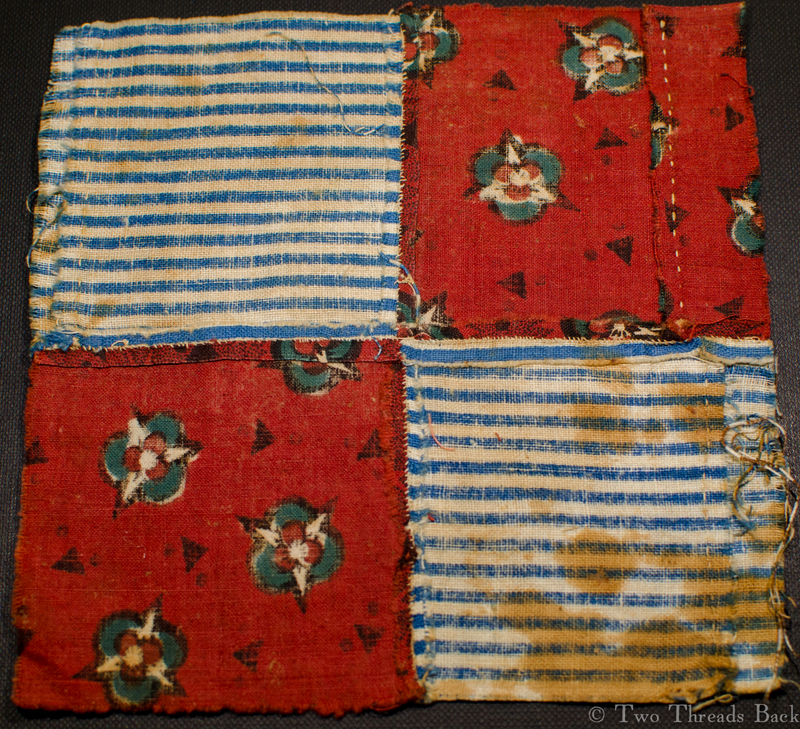 The quilt fabric, however, is heavily glazed, and I have no idea whether it was used for apparel or furnishings. 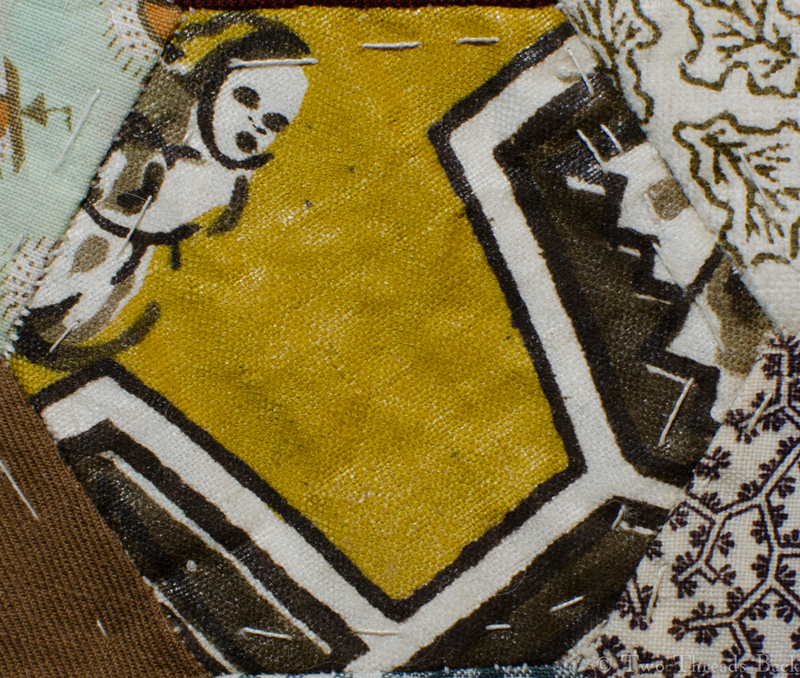 I re-read the section on yellow dyes in Susan Greene’s Wearable Prints hoping to identify the type, but decided I’m too inexperienced for that. 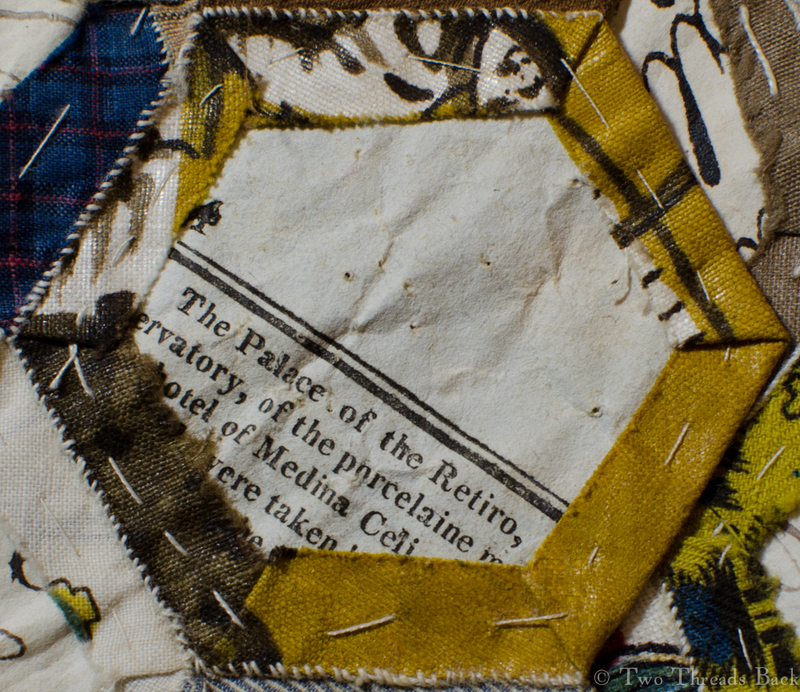 As for date, the little bit of text printed on the back of one of the pieces was an enticing clue. I was surprised to see how many early publications appeared after a keyword search. Even after I filtered the results by spelling and phrasing, there were way too many to pin it down. And I found that many publishers “borrowed” and reprinted much more often than I would have expected – even for that era. But I did get it narrowed to circa 1808 or ’09, the British Register, Political Register, Annual Register, Literary Register, Cobbett’s Register…. At that point, I guess it registered with me that the exact source would remain uncertain. 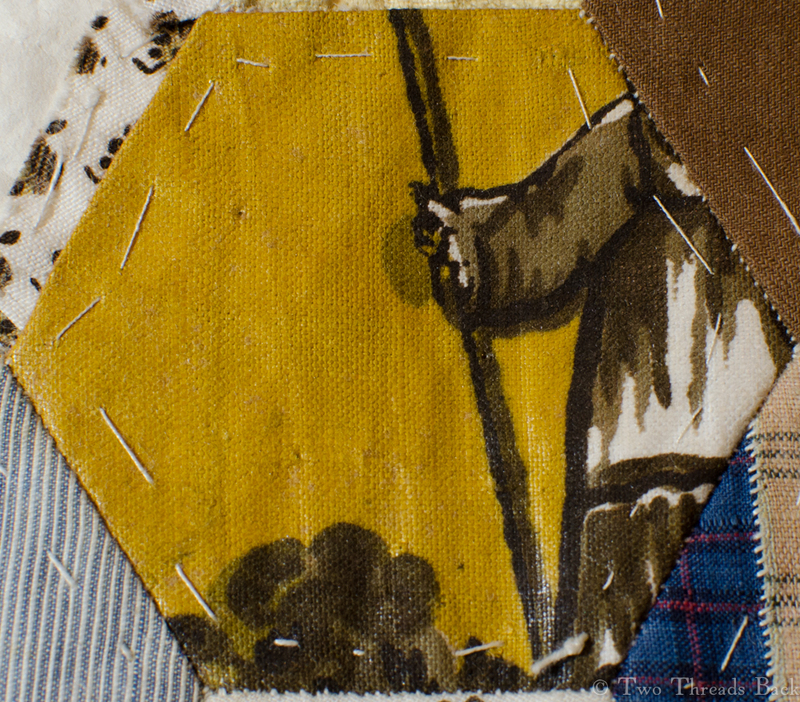 The right side of the patch showing an arm holding a – parasol? 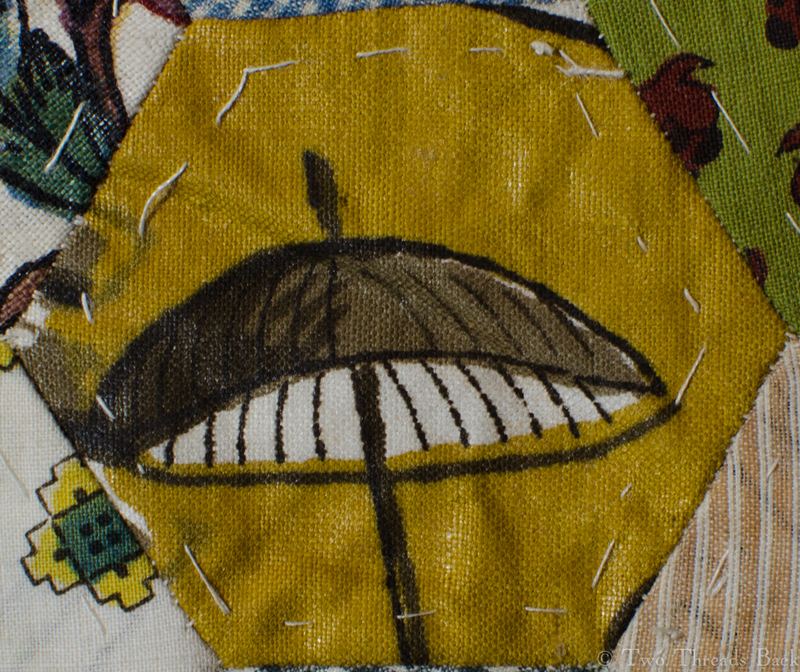 This piece shows a person’s face. 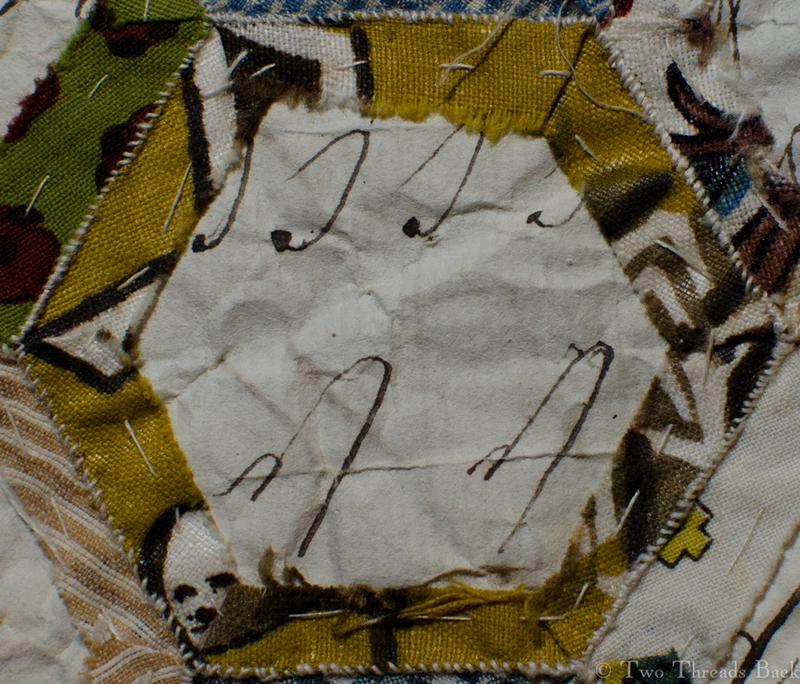 The reverse of the patch above, with writing from a copybook. 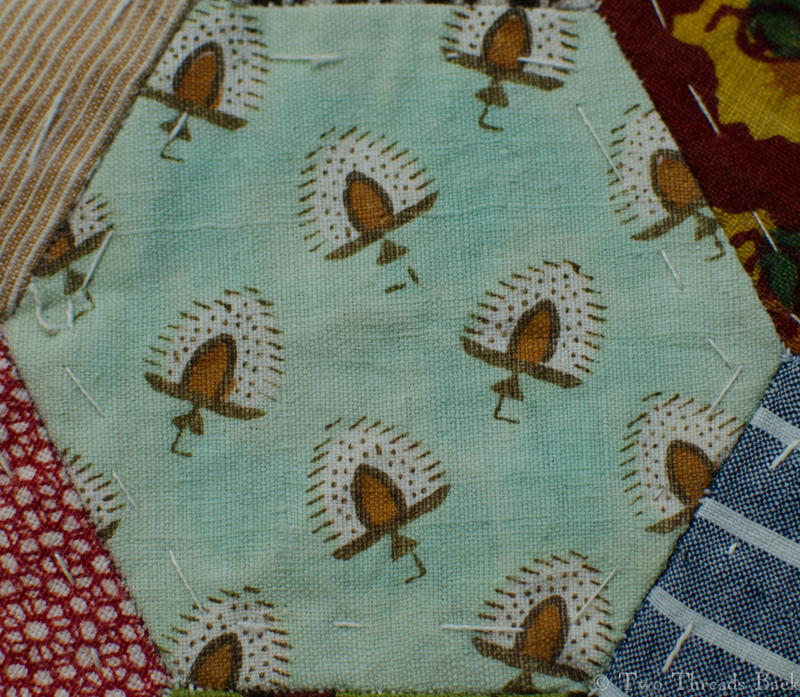 A patch with a parasol. 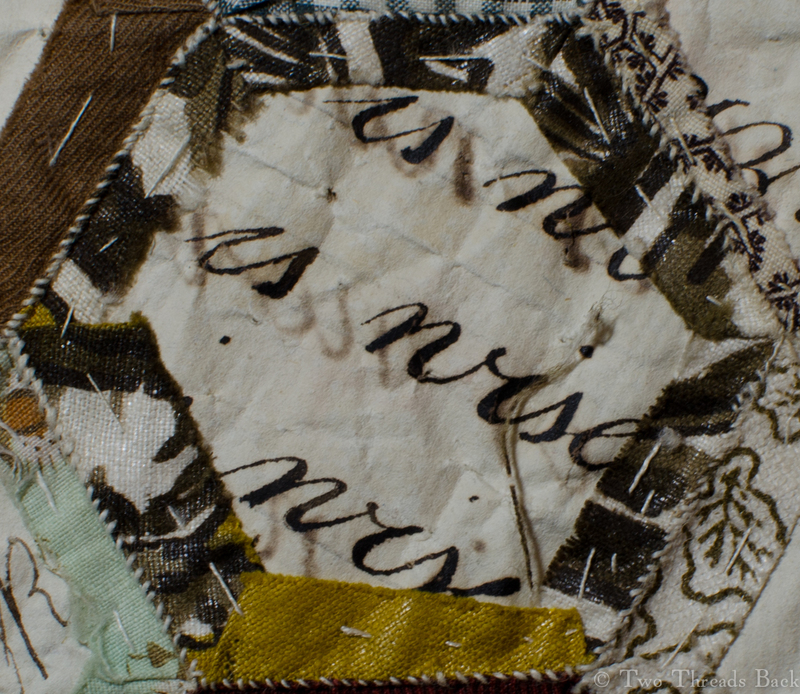 And the back of the patch with a parasol, also with copybook writing. Here’s a flower patch for the lovely month of May since it is (now!) a pretty spring color. The print is similar to the others I’ve posted, but the mint green color is unusual. Actually, I’m not sure exactly what the original shade was, because you can see that it has faded unevenly – dyes of the era were notorious for their fickleness! 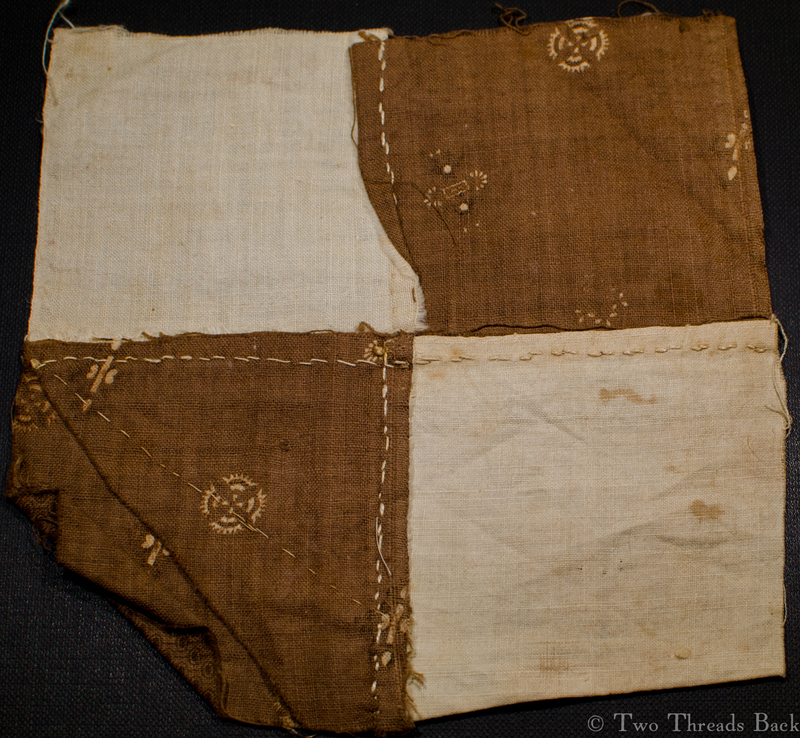 Unlike the other fabrics, it does not have a shiny new glaze, since it must have been washed and worn earlier in its life. A view from the back. I doubt the copybook word was “womankind”! 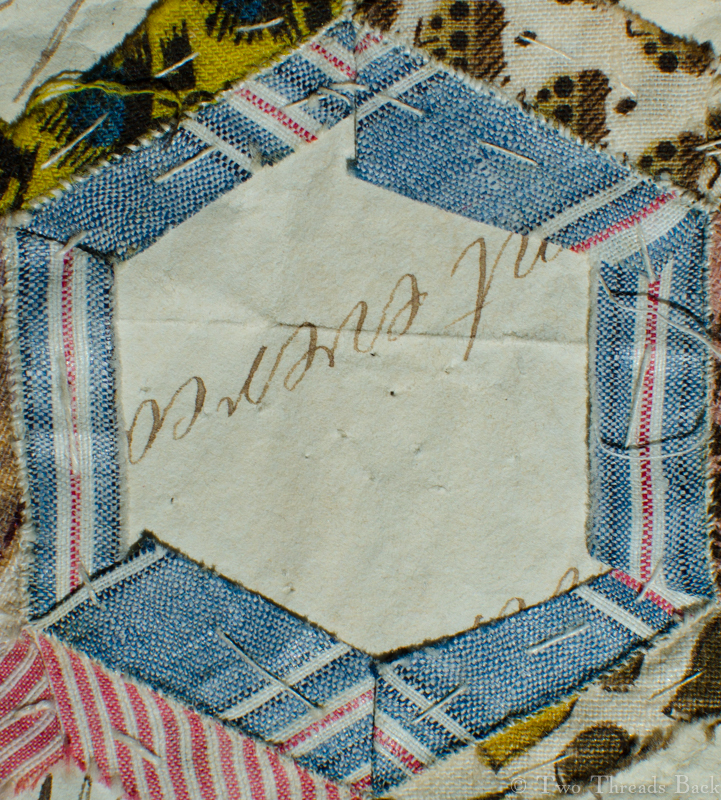 Early 19th century cotton print, a hexagon in Christmas colors. Time for a short post before Christmas! 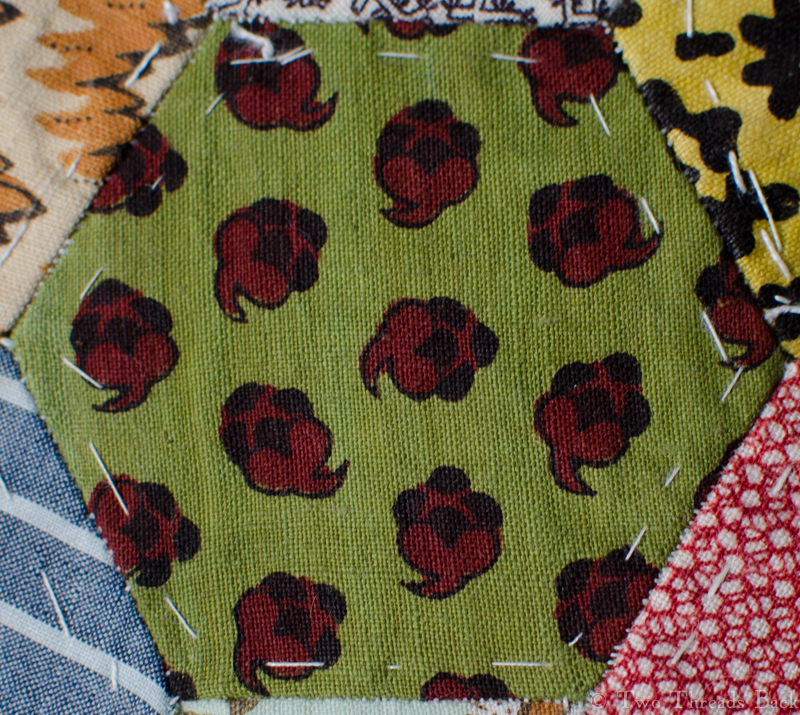 Here is a patch in Christmas red and green, with a little black accent. Once again it has the peculiar (to my eyes anyway) mouse-squiggle-alien creature-seed pod-flower design. Buti? Boteh? “Shawl pattern”? Indian import or English version? I don’t know. 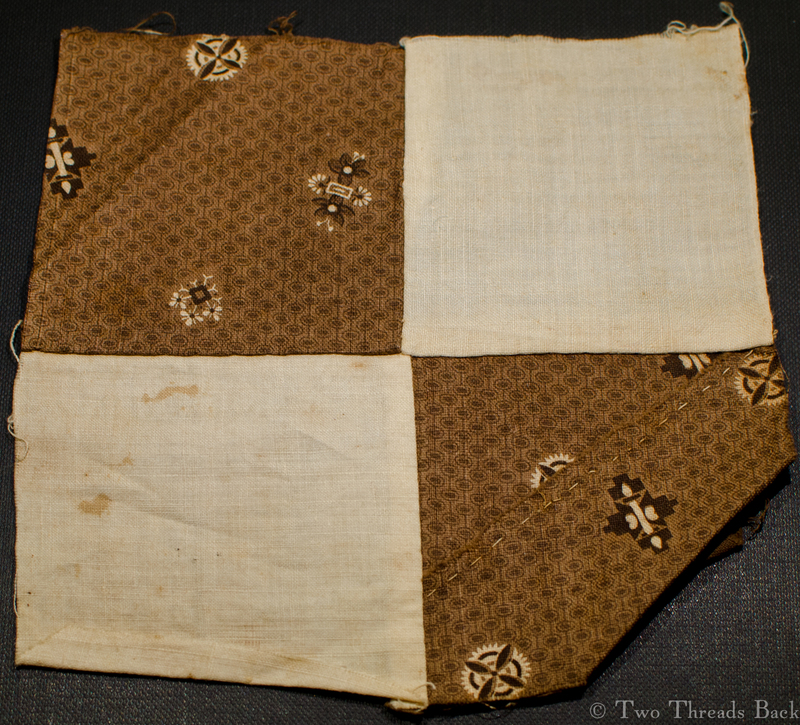 But I do know these patterns on calico show up a lot in the first decade or so of the 19th century. 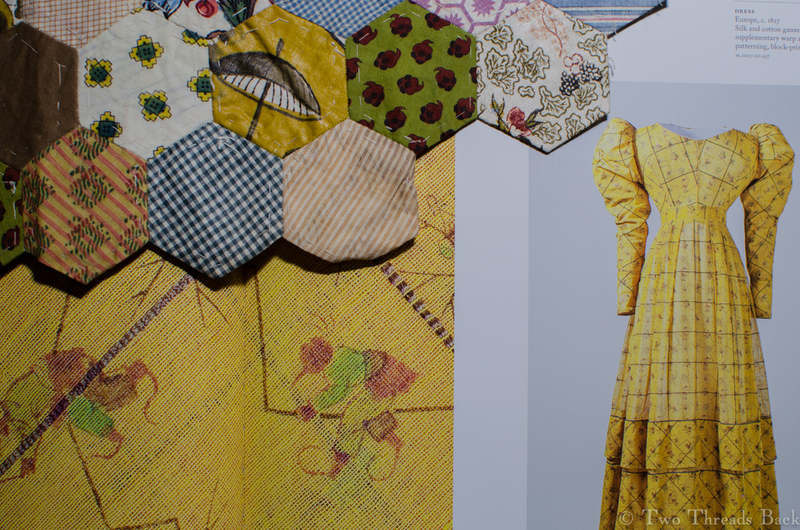 If you search for Ackermann’s Repository, the plates with fabric swatches attached, you’ll see them in many dress prints. 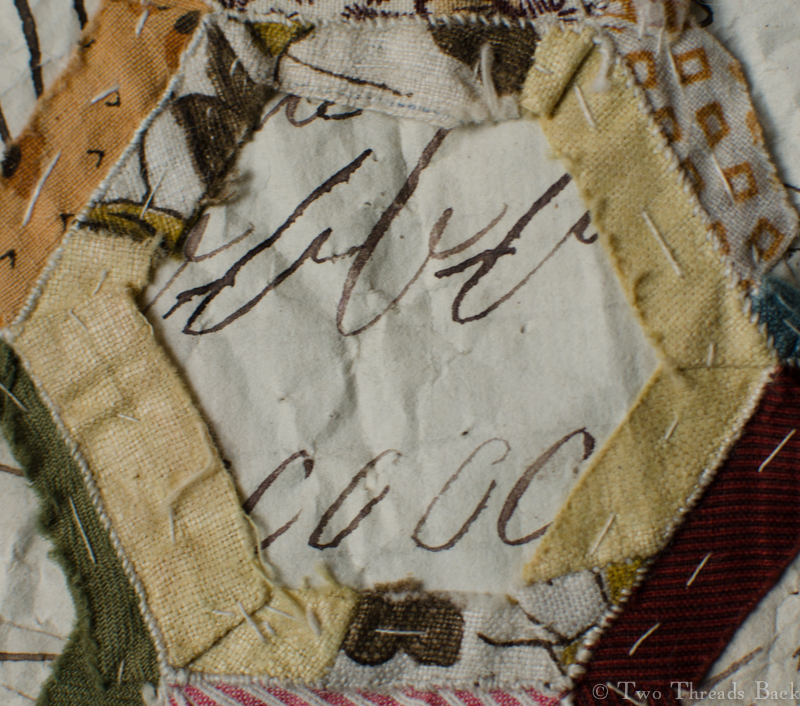 Here’s the view from the back, which clearly shows the closely “seamed” stitches and a bit of copybook writing. 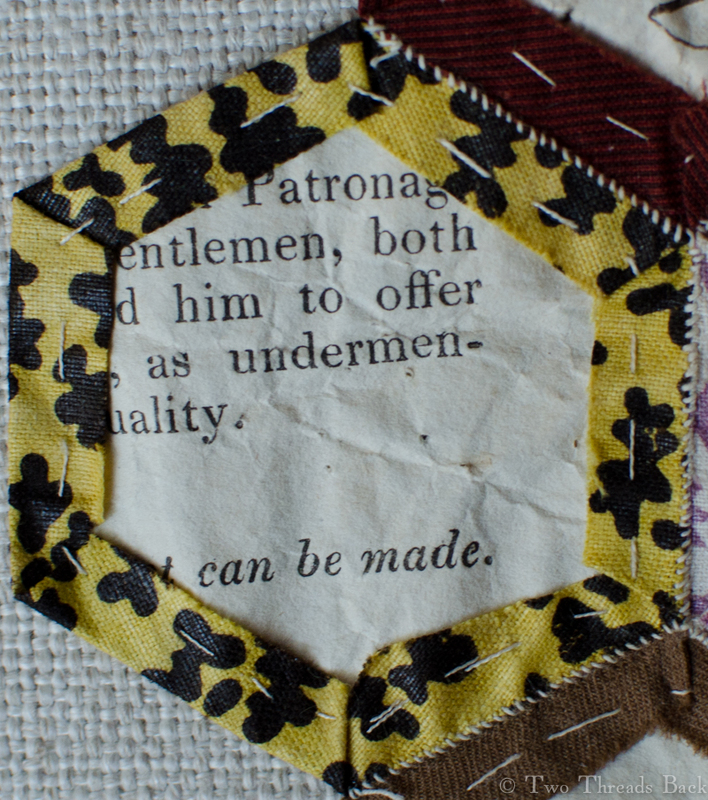 Early 19th century English paper pieced patch – with ugly leaves. 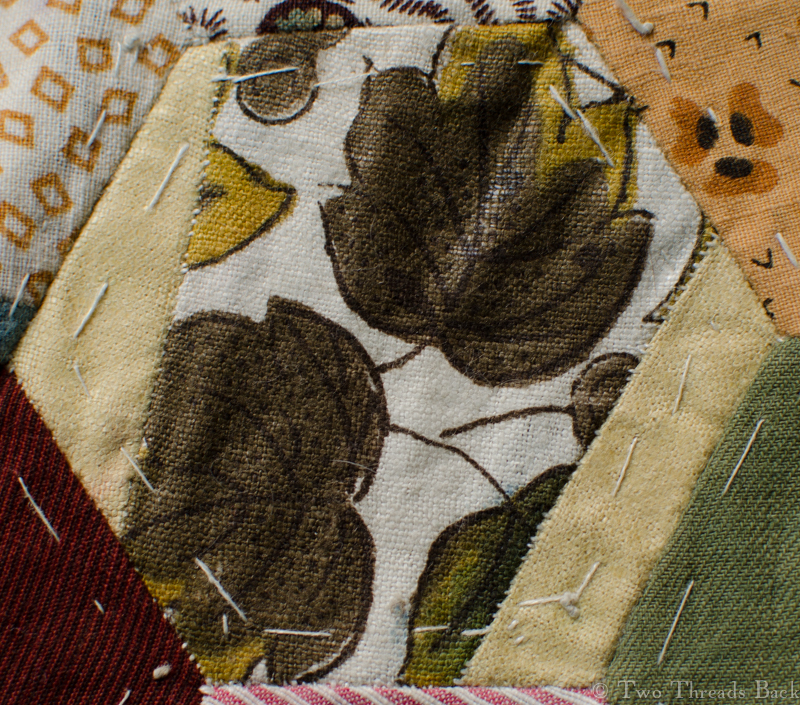 I chose another pattern for the season, and in honor of Thanksgiving week, it’s one with leaves! But to be quite frank, it’s pretty much… not pretty. 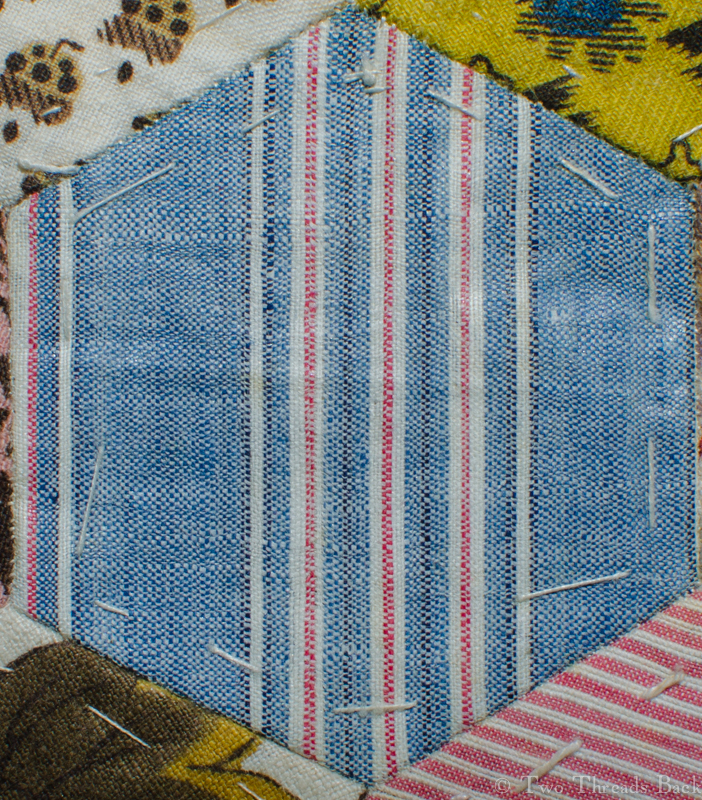 Perhaps the whole pattern was nicer, and it’s only this snippet that is less than attractive to me. The maker was certainly wanting to use it though, because she had to piece the piece. 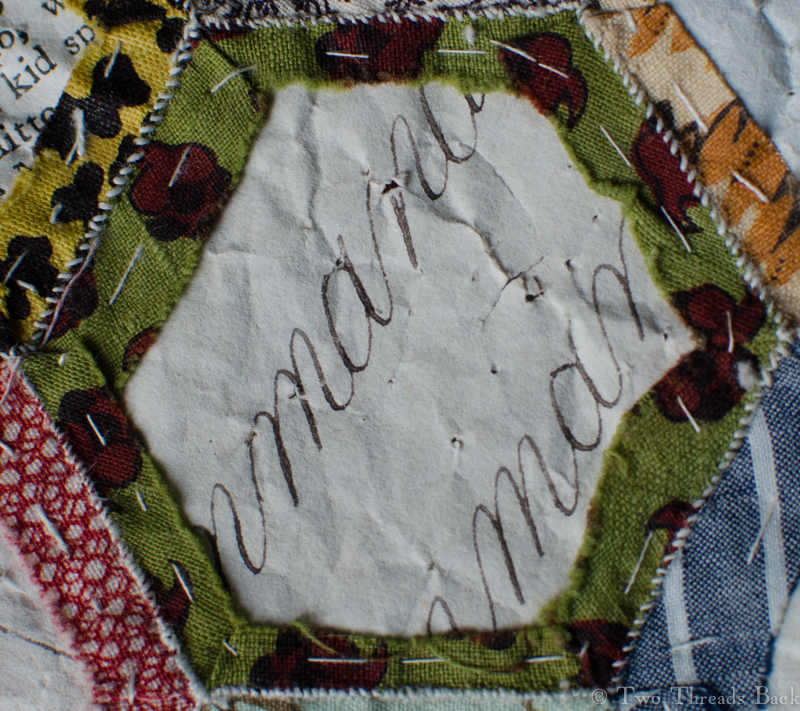 You can see just how tiny the scraps were, and it amazes me that she made the effort. 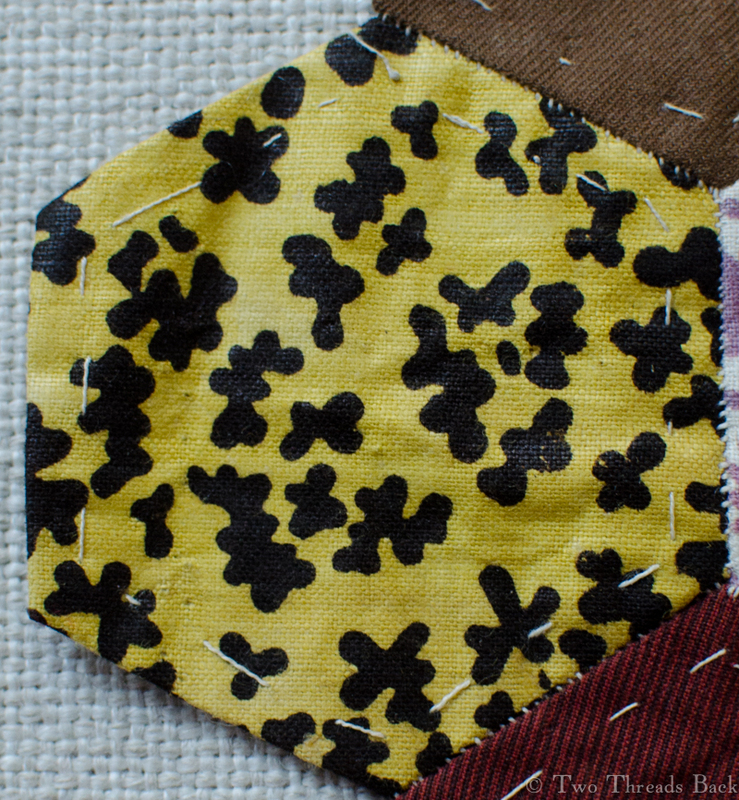 Keep in mind the whole hexagon is only 2 inches across! 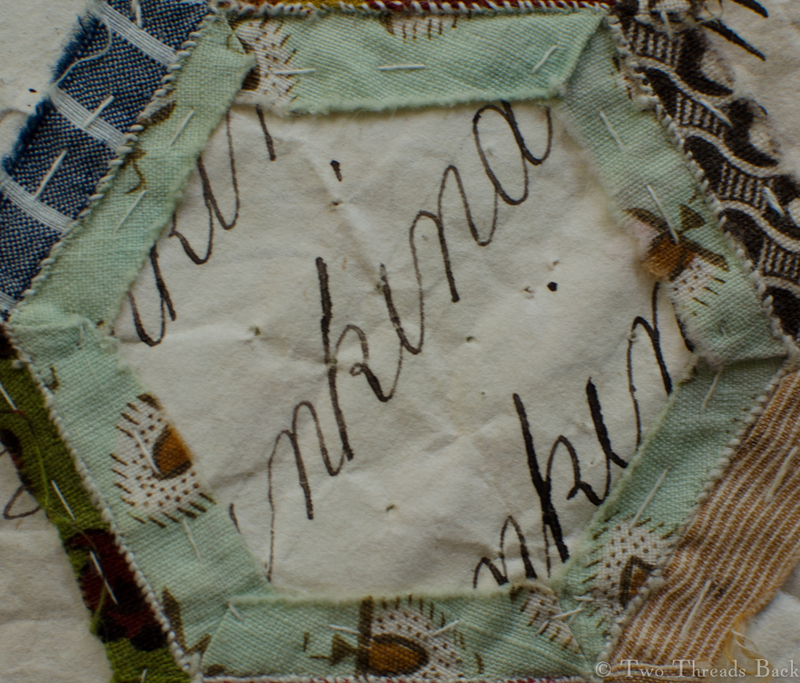 A view from the back, showing part of an old copybook page that was used for the pattern. Something else that I find surprising in these sections is just how many of them have their original glazed finish, or sizing. 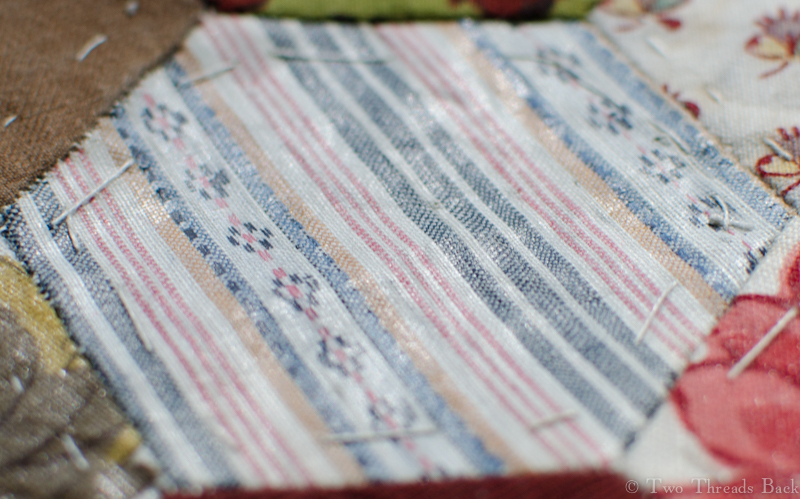 Perhaps they were only cutting scraps, not from worn out garments. Even though times were changing, fabric itself still had more value than the average worker’s time. And it’s not just the fact that the scraps retain their glazing, I’m really surprised that so many of the pieces have it at all, enough to make them very shiny. I have to angle the photo “just so” to limit the reflection. Hmm… something to reflect on….